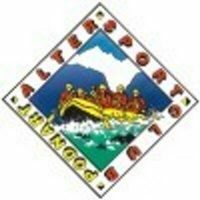 for more information call 040663355 or send an e-mail to altersportklub@gmail.com. 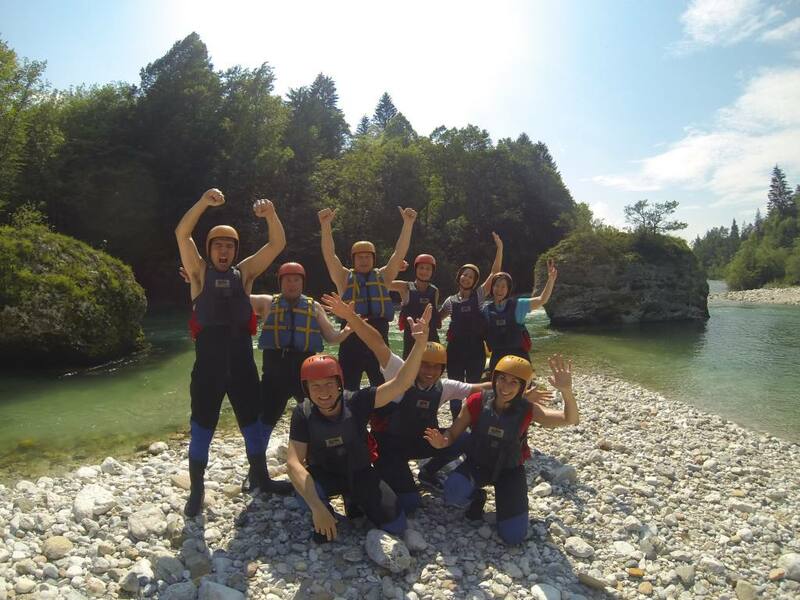 We are a Slovenian sport agency and for the last ten years, we deal with outdoor sport activities, such as: rafting, kayaking, canyoning and caving. We are located in the village of Posavec, about 14 km distance from better-known Bled in Gorenjska region, where we have our rafting centre. 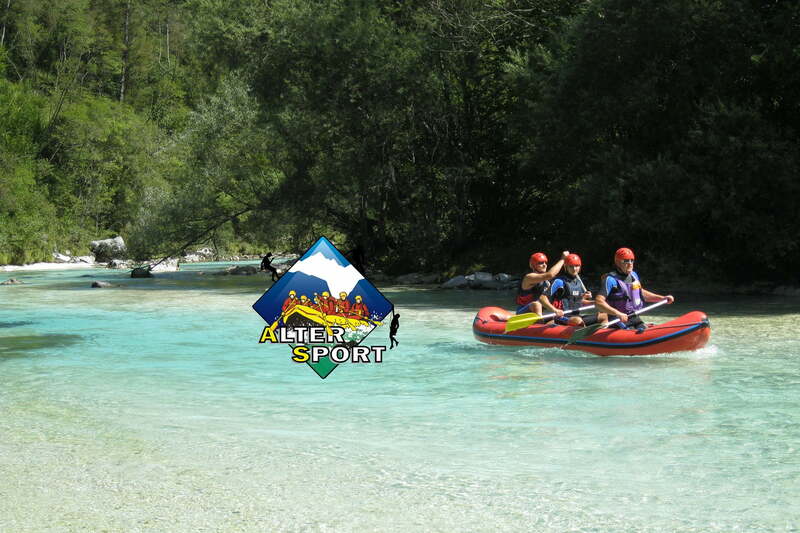 There, we usually end our rafting descents.With a partner, who owns a small hotel, with a restaurant at the same place, we can also offer food and accommodation, as well as sport activities..
ALTER SPORT sport agency offers all this and more! For all additional information please use the contact form provided in the Contact tab or any of our contact numbers. 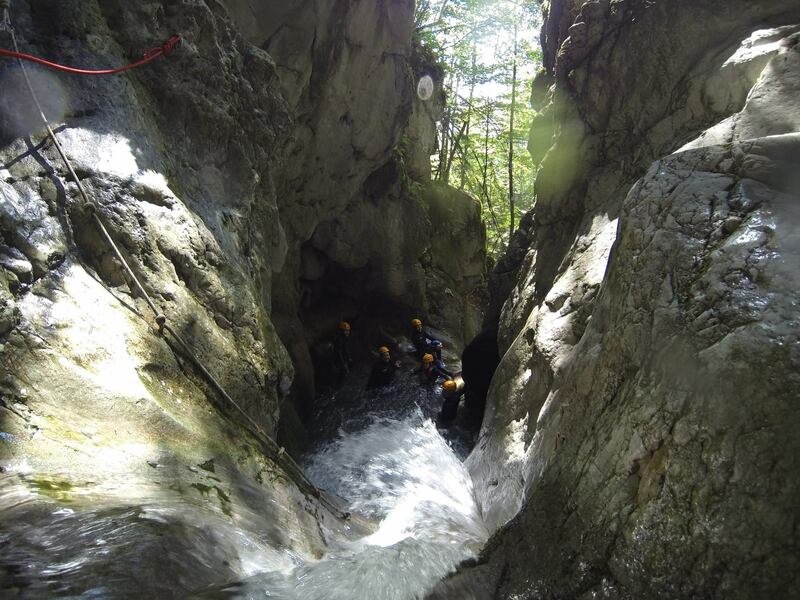 Get in touch with us today and embark on your adrenaline filled adventure! 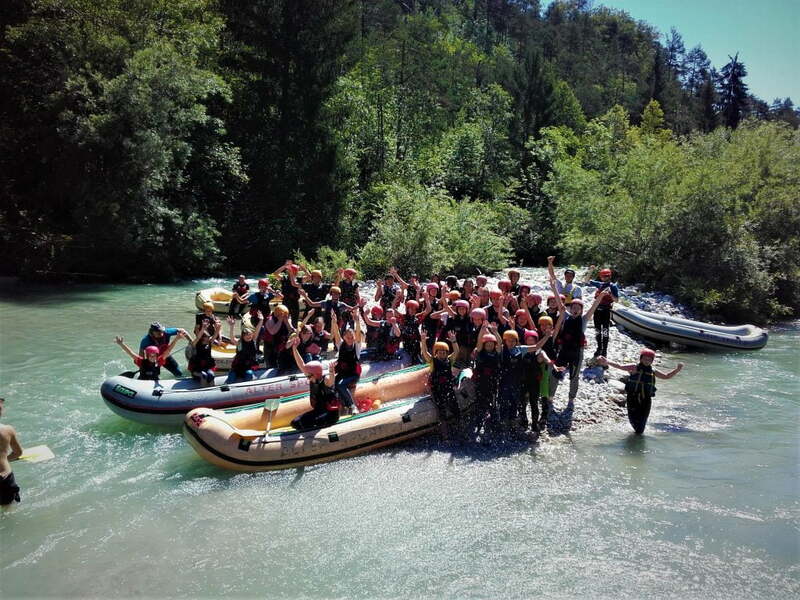 Rafting – going down wild waters by inflatable rubber rafts – is gaining growing recognition as a serious sport. At the same time this is an extremely popular recreational activity; a splendid opportunity for active use of spare time. 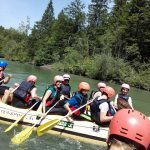 How does an organised rafting trip look like? The organiser takes care of the transport to the starting point of the trip; there we all merrily slip into neoprene garments, life jackets and safety helmets. Next you learn some theory: how to use your oar and what to do if you fall into the water. 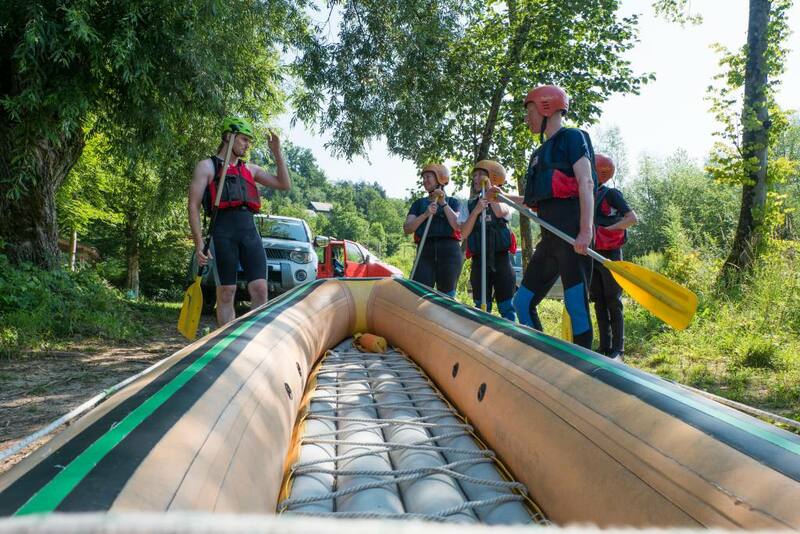 The guide manages the raft with his oar, and the passengers help him with their own oars. On a hot summer day it is very agreeable to refresh in a pool. In this way we reach our destination – full of impressions of a pleasant (short or quite long) river trip we have just made. 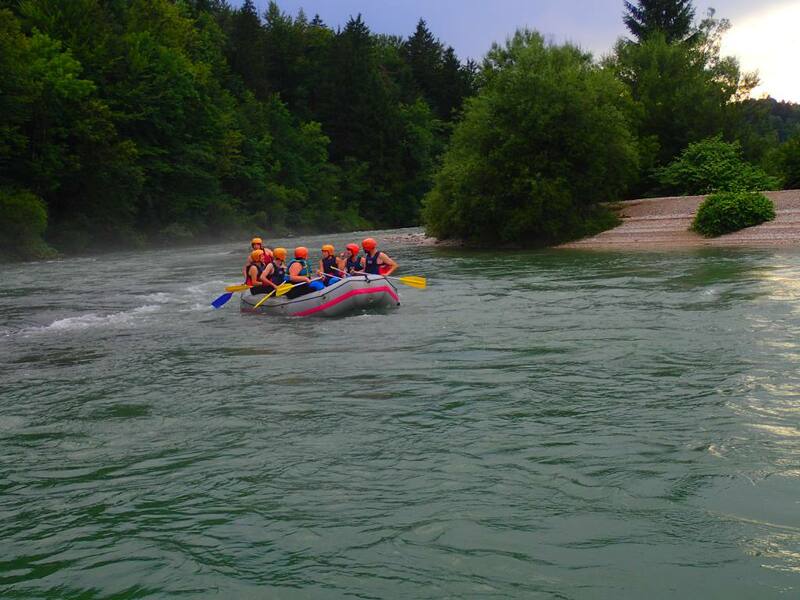 If you have decided to explore the rivers of Gorenjska from a raft, you are invited to join us. -All those trips are from 3-4 hours long. -Gear, guide and transfers are included in the price. -We pick you up on your location and deliver you back. -All you need is a swisuit and a towel. Everything else we bring with us on the location. For additional information contact us via our contact form or our telephone number. 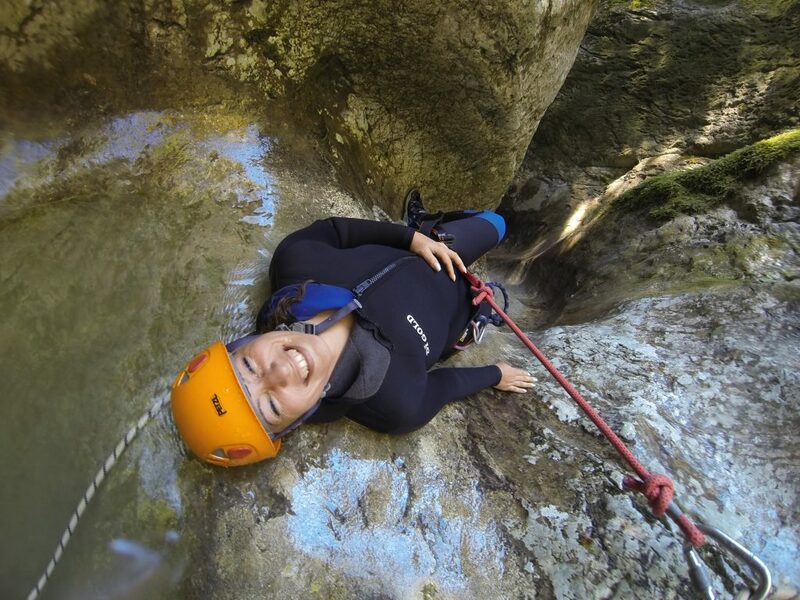 Contact us and embark on your adrenaline adventure today! Rafting on Sava in autumn from Kato on Vimeo. 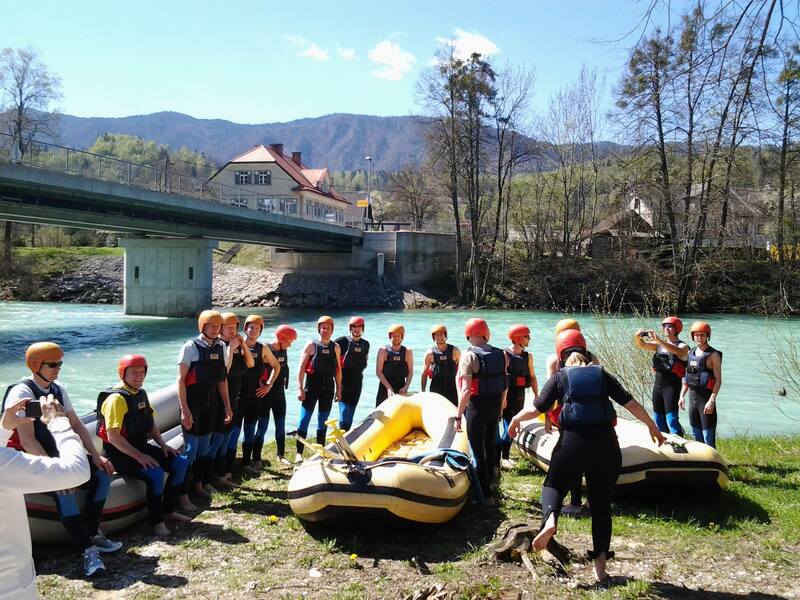 Radovljica is the starting point of a fairly undemanding rafting trip, though it does include riding some rapids. The only rather demanding part is the pass before the village Globoko. There is a nice beach and some jumping options in the middle. We land at Posavec, where we can smell from afar the delicious food barbecued for us on a picnic place at the end. Class II. Paddling on Sava 2012 from Kato on Vimeo. 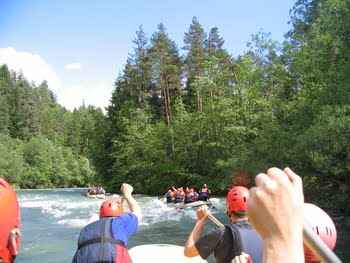 The trip down the Sava Dolinka begins bellow the village Zasip. 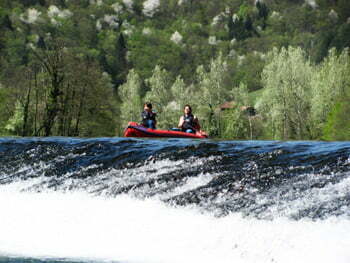 If the water level is favourable, a very lively trip can be expected. Suprise activity is waiting in the middle. 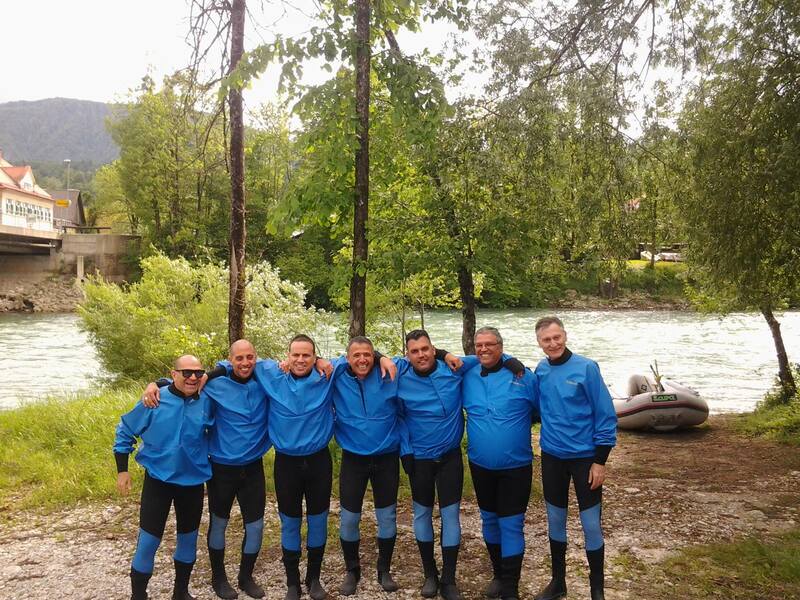 We row pass the camping-site Šobec to the confluence with the Sava Bohinjka, and soon land at Lancovo near Radovljica. Class II-III. 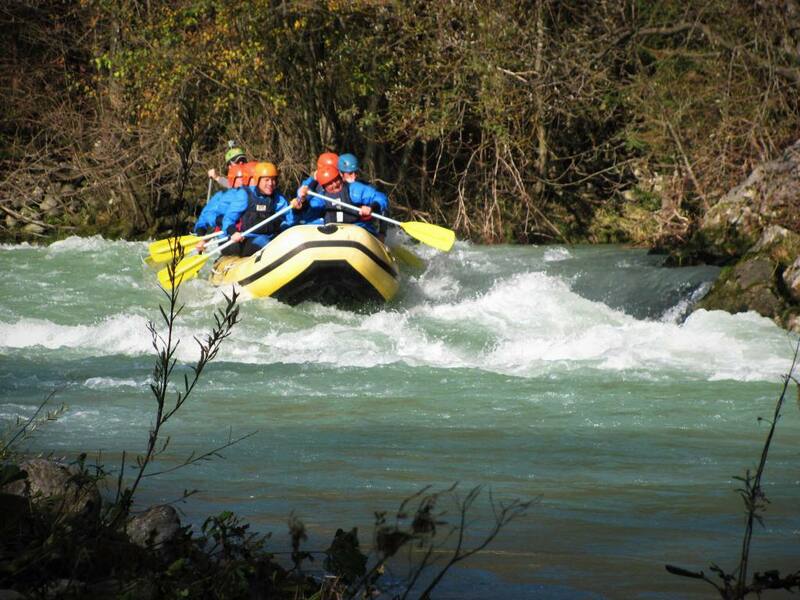 If you wish to enjoy rafting for several hours, you are invited to join us in our longest trip. We row down the Sava Dolinka from Zasip to the confluence with the Sava Bohinjka, and then down the Sava to Posavec, where a barbecue on an islet is prepared for us. Class II-III. We can organise a trip with a celebration at the end. Beautifull picnic spots at the river and good food with cold drinks. Picnic menus and offer is avalible upon request. Down the highway from Ljubljana towards Jesenice turn right at the Tržič, Podnart exit. Take another right for Kropa, Podnart to the roundabout. In the roundabout take the second exit right, than drive straight for Podnart, Kropa. At the crossroad in Podbrzje turn right and follow the Brezje, Črnivec road. In the villge of Posavec turn left for Otoče, after 50m just before the Sava bridge, turn left. Down the highway from Jesenice towards Ljubljana turn right at the Brezje, Kropa exit. Take another right for Kropa, Podnart then drive through the villge of Dobro polje to Posavec. In the villge of Posavec turn right for Otoče, after 50m just before the Sava bridge, turn left. 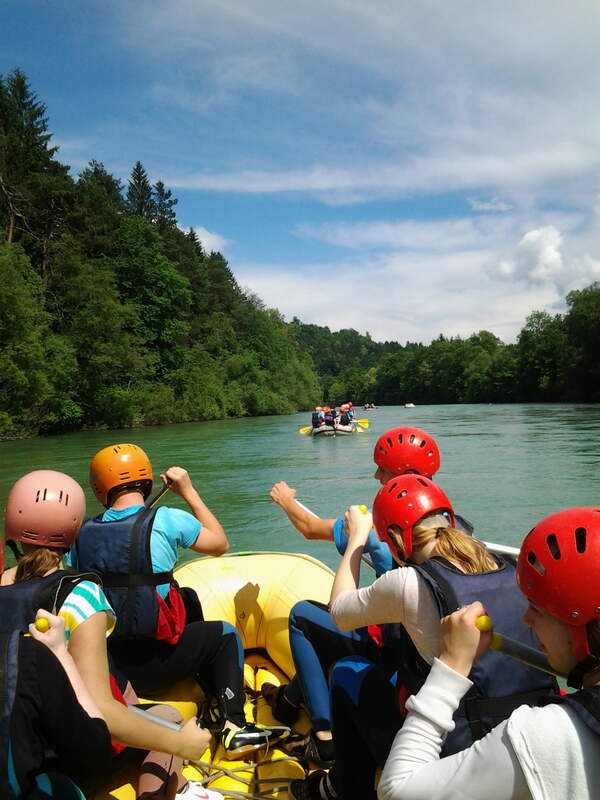 Spend a school trip or a sports day in our company. We will show you a new and unforgetable experinence. We offer rafting down the rivers of Gorenjska and a school of kayaking in RAFTING CENTER POSAVEC. 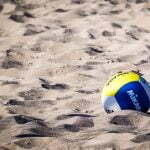 Here you can also enjoy beach volleyball, tennis and archery. 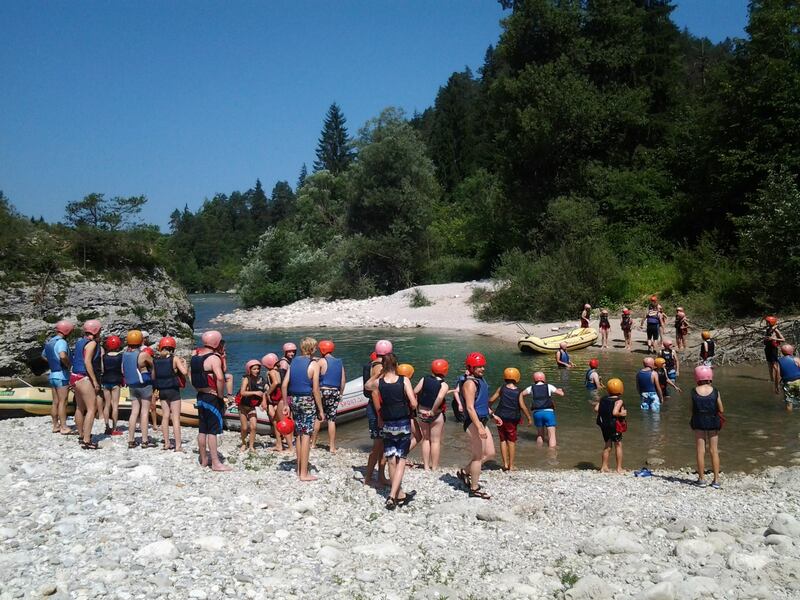 For middleschool children descent down the Sava river from Radovljica to Posavec is more suitable. For highschool children all the descents are suitable. Prices apply to school groups of 15 persons and over. For teachers and escorts – no charge. Per request we can organize a picnic on an island on the Sava river, pizza in a local pizzeria or lunch in a nearby pub. Prices per agreement. 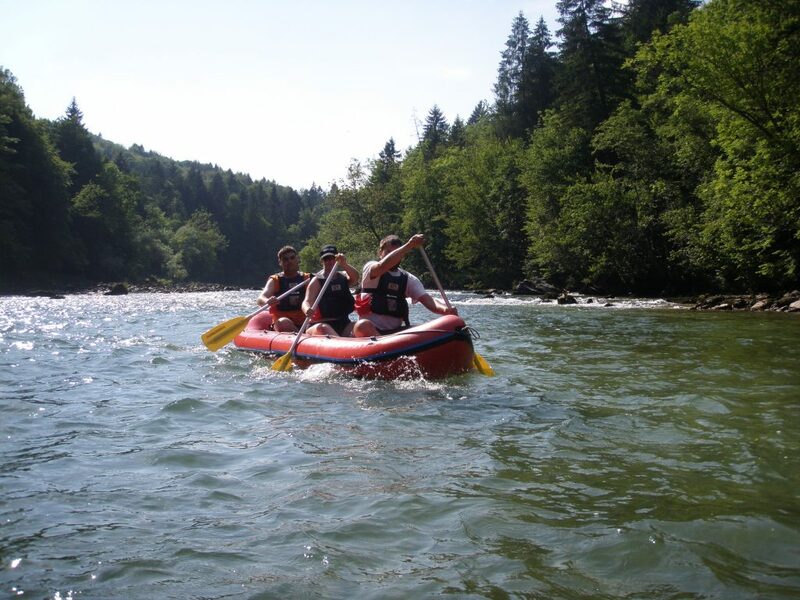 Rafting: At the beginning of the rafting trip all necessary equipment will be provided. 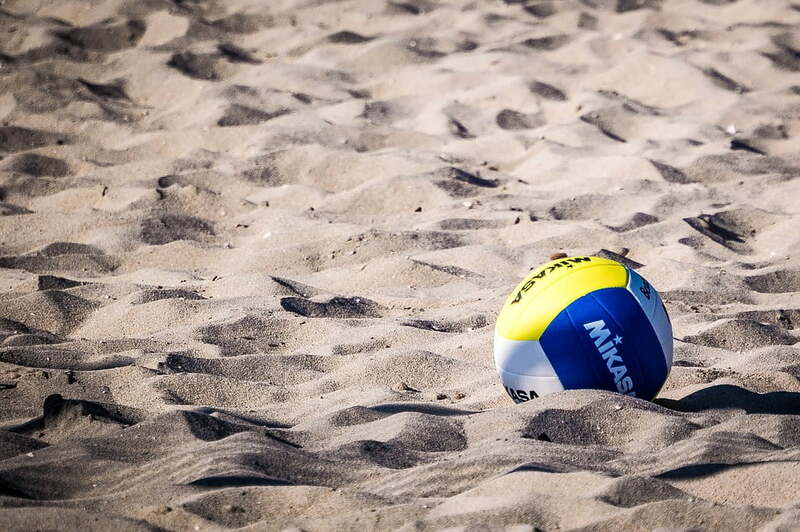 You will need to bring a swimsuit or shorts, tshirt, sneakers and a towel. All of the above will get wet. 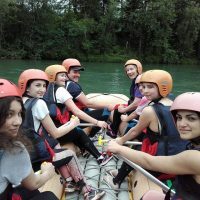 Every raft has 6 to 10 people and an experienced gude who steers the boat with a paddle, gives instructions to the crew and is responsible for safety. Insurance: All the guides are experienced proffesionals. 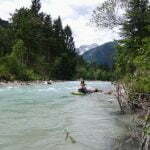 River segments are chosen to avoid unnecessary risks. 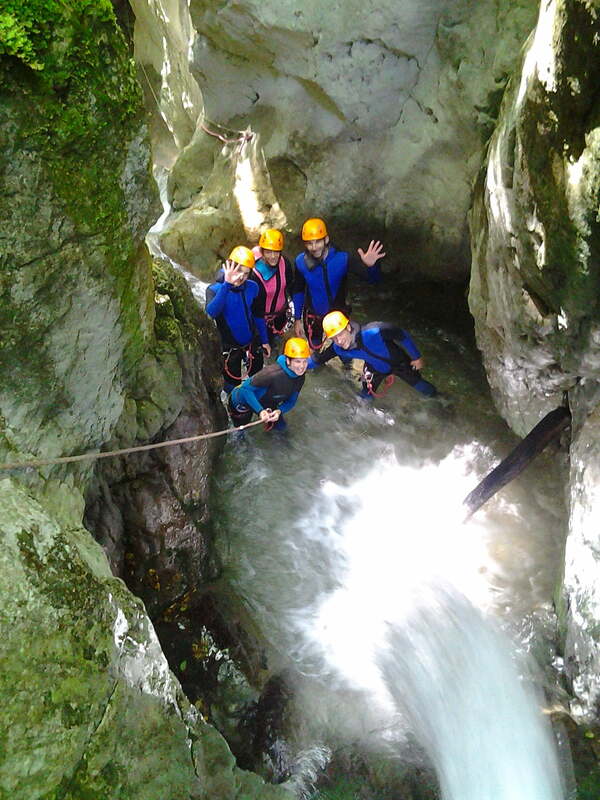 All participants are insured at Zavarovalnica Triglav during the descent. Archery instructor is available for lessons and organizing a friendly archery competition. Train transportation: All the trips on offer are also available to train passengers. 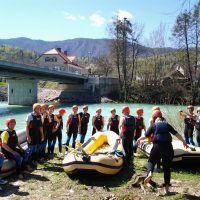 From the train station in Radovljica to the rafting starting point is a 10 min walk, and so is the distance between RTC Posavec to the Otoče train station. 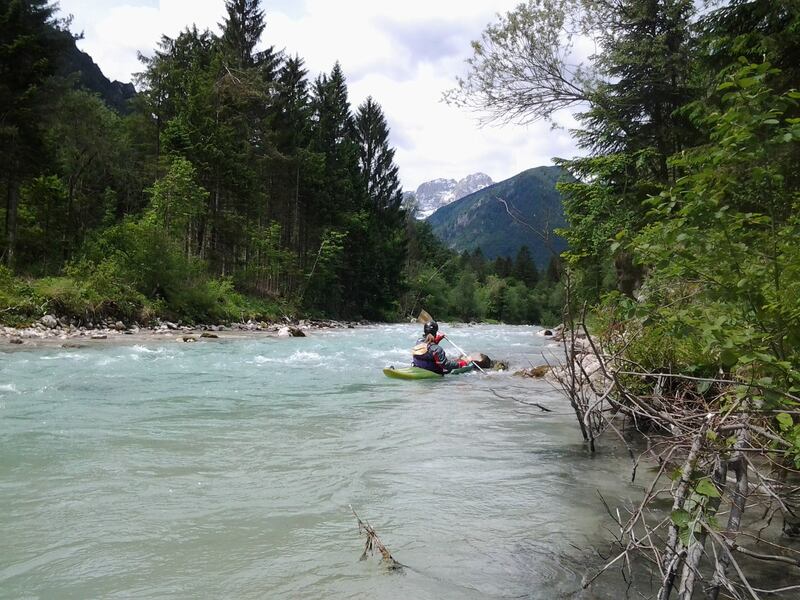 Descent down the Sava river to Posavec, takes an hour and 15 minutes..
A longer and more attractive descent down the Sava Dolinka and Sava rivers from Zasip near Bled to Posavec takes 2 and a hlf hours. 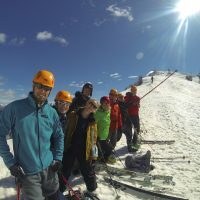 Prices include equipment rent, insurance and a guide. 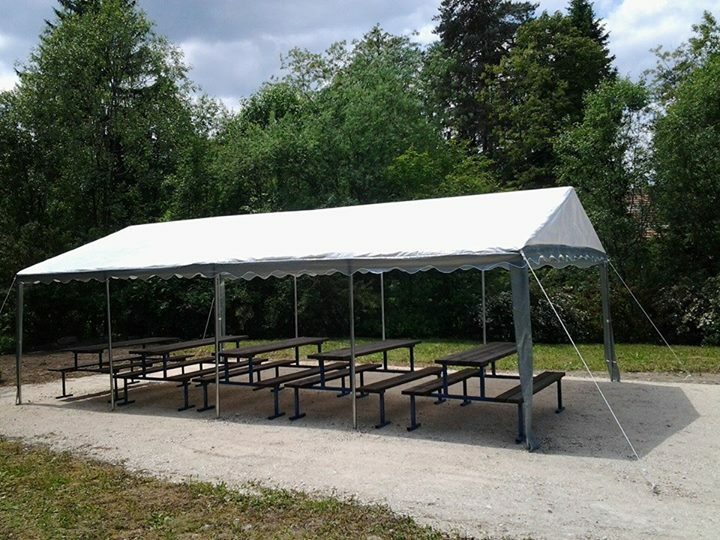 Per request we can organize a picnic or lunch in a natural setting on a green island on the Sava river. Read more at Culinary offer. 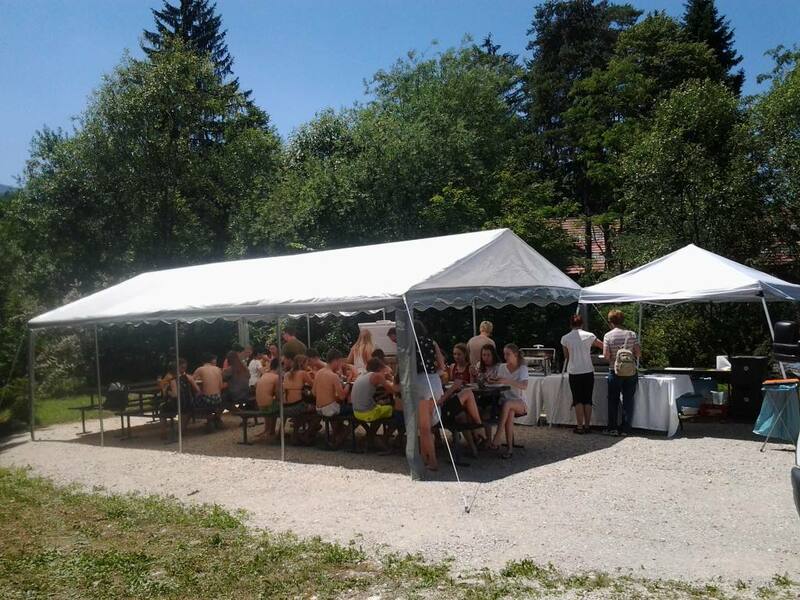 WE GUARANTEE THAT NO ONE HAS LEFT POSAVEC HUNGRY OR THIRSTY: PERHAPS ONLY A LITTLE TIRED! 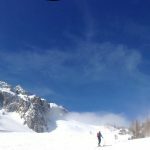 Unique experience in wild country side which requires knowledge of alpine skiing. 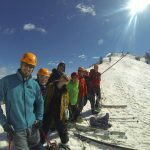 At ski touring we use skis that offer us option to walk up the top and ski down from the mountain. 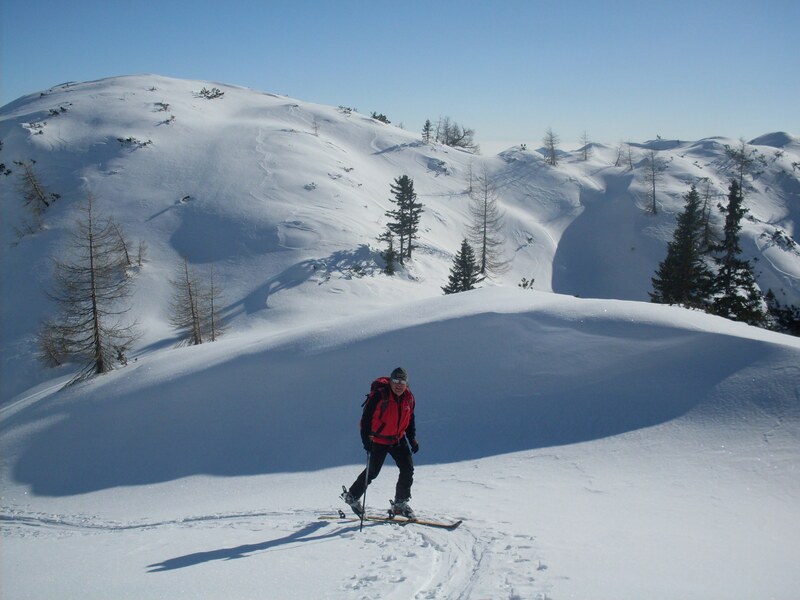 Ski touring equipment is adjusted for walking with the skiis up and skiing down the untamed slopes. 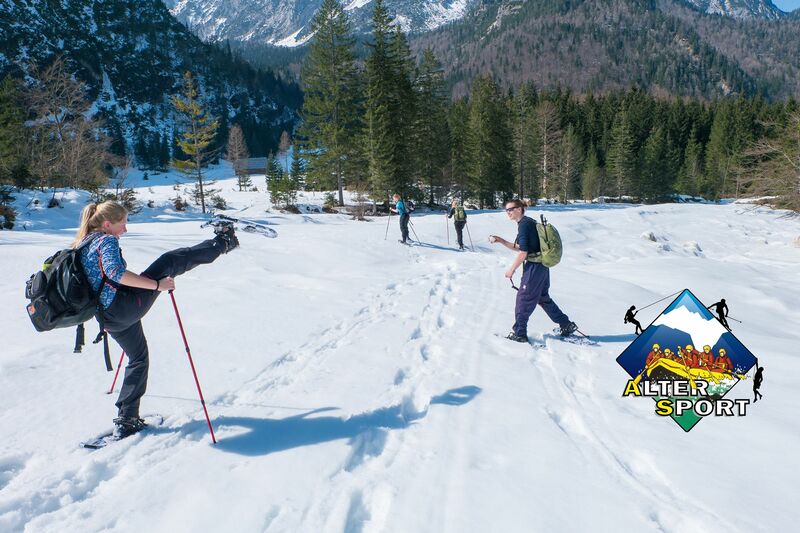 We will guide you on the peaks of Julian Alps and give you some basic lesons of walking and skiing with this gear. Waterfalls are popular throughout the whole year. Wonderful to watch, great to relax at and perfect to photograph. 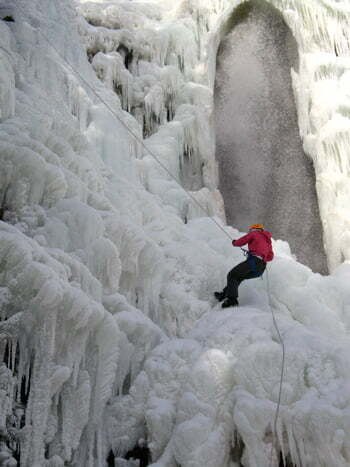 Besides touching the waterfalls in the winter season it is also possible to climb them. 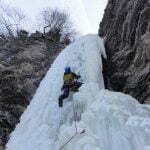 Ice climbing sport is quite demanding therefore practice it only in the company of an experienced guide. 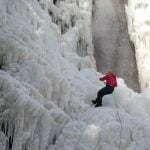 If the conditions will be safe, we will do a short walk to the nearest icefall and give you a chance to climb in this unique terain. 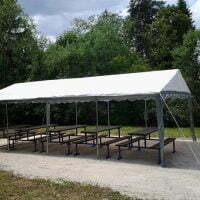 We will provide al the needed gear and give you instructions. With top rope technic, the climbing will be totaly safe. 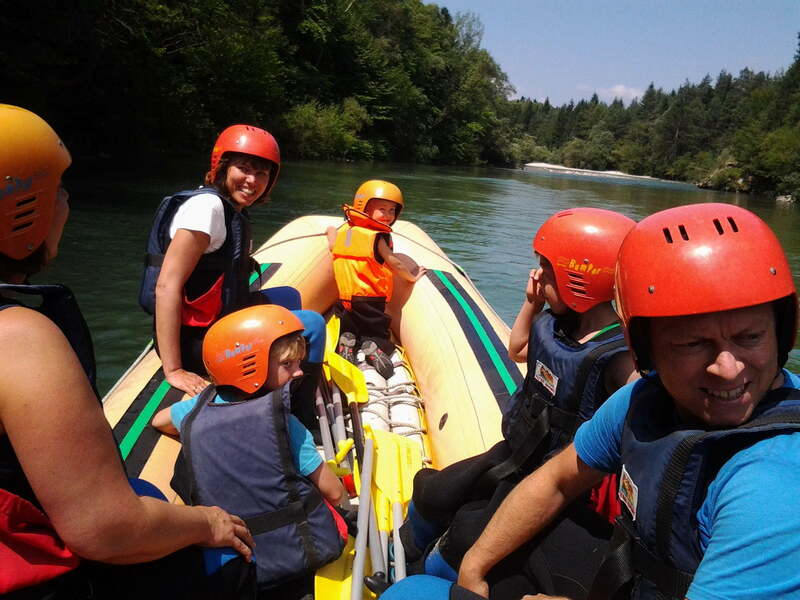 In the vicinity of Stari trg we rent mini rafts for relaxing trips down the Kolpa river. 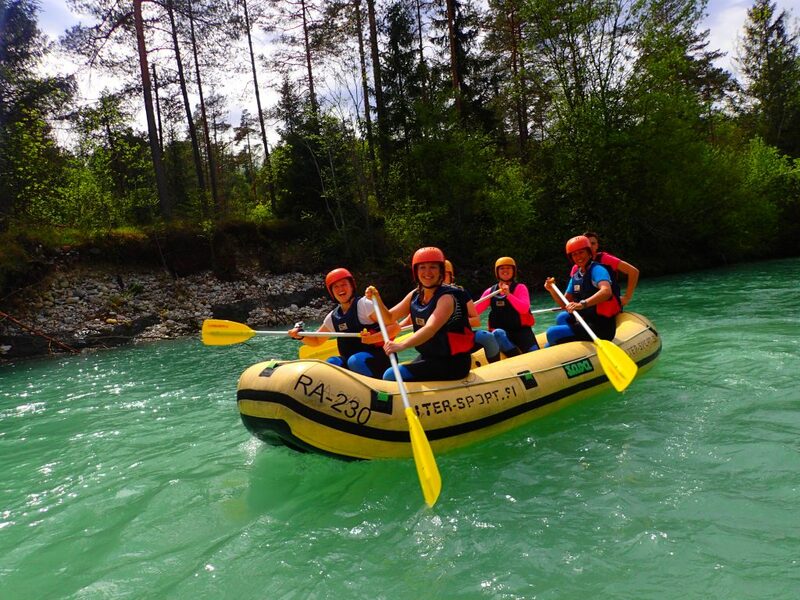 Rafts are suitable for 2-3 persons. 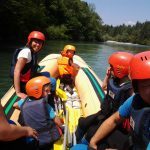 They are stable and easy to steer, that is why they are the most popular boats on the Kolpa river. 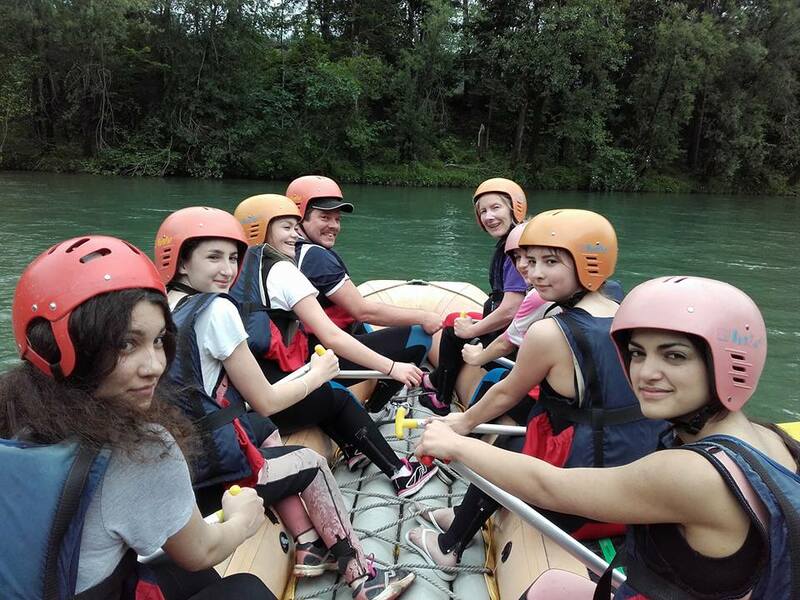 We organize transport of te participants and can also advise you in choosing the most suitable section of the river. 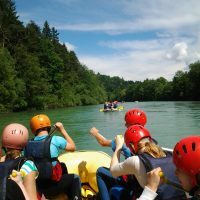 Optional camping 1-2 nights on a plot ner the Kolpa river with a beach. 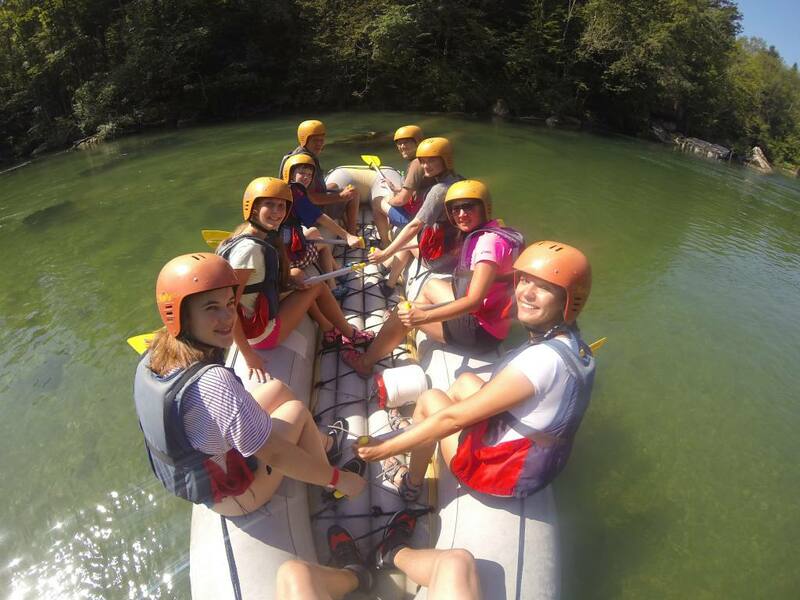 Additional offer: renting rafts for 6-8 persons with or without a guide. 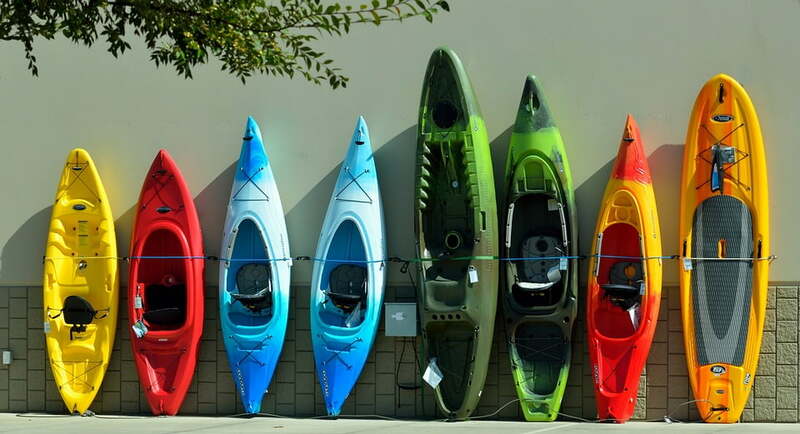 Prices are per person and include the rental cost for the boat, oars, life jacket, helmet, neoprene shoes, watertight barrel. Insurance and transport to chosen location are also included in the price. 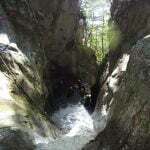 Water has cut into the rock wonderfull basins, slides and pools. Here the waterfalls are not too high and the water isn’t rushing. 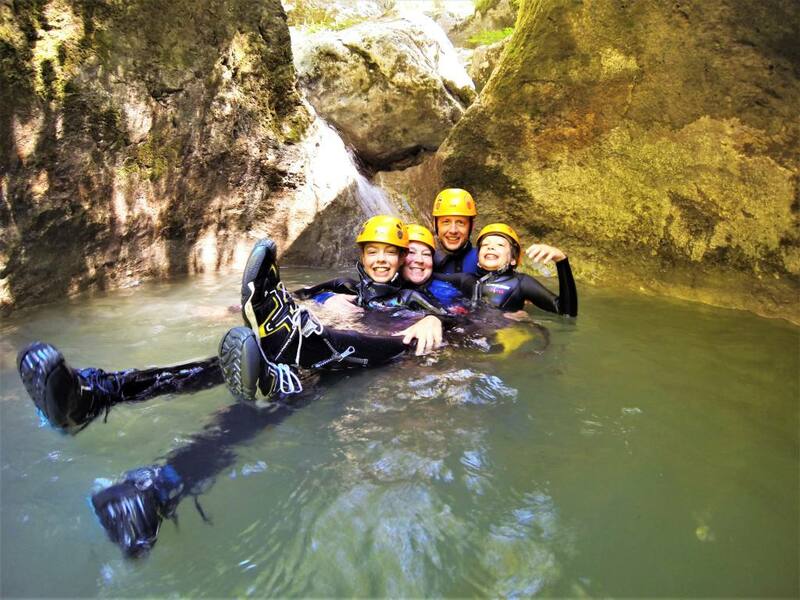 An experienced guide will lead you through the river basin full of crystal clear water and beautifull green canyon walls. 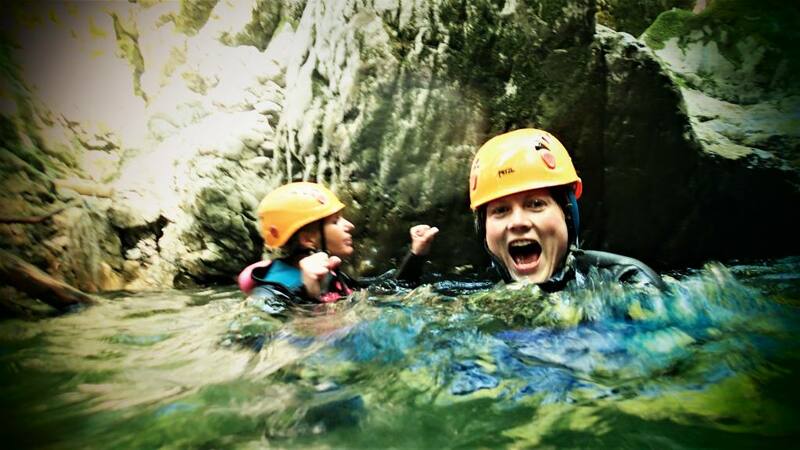 Sliding down natural slides and swimming through a gorge. Enjoy the beautiful nature and the refreshing cool water on a hot day. 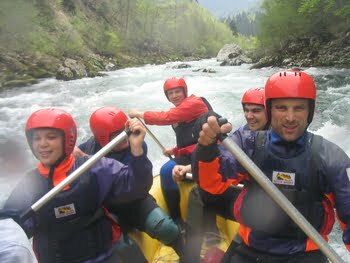 River trekking is a novelty brought from France. 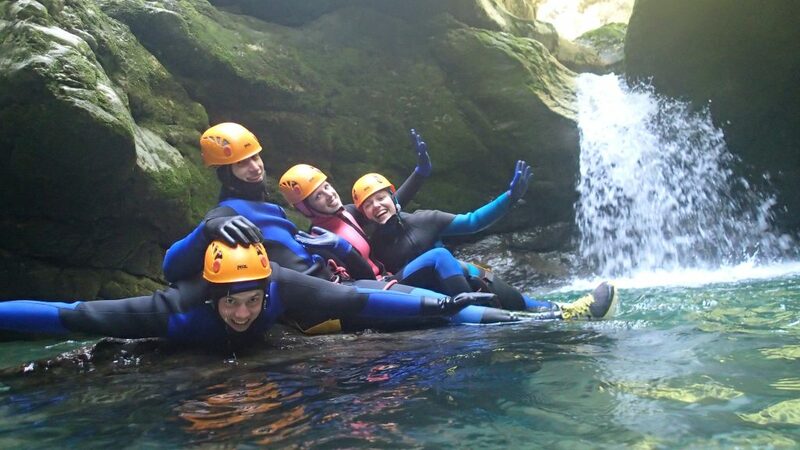 We choose a calmer gorge, which is suitable for less active guests, who will enjoy swimming and riding natural slides and waterfalls. Per request, rope rappelling and pool jumping is also available. Return through a mine shaft. The price includes transport, guide, insurance and gear: neoprene suit, neoprene socks, helmet and safety harness. Reqired gear: Swimsuit, t-shirt, towel and hiking or trekking shoes. 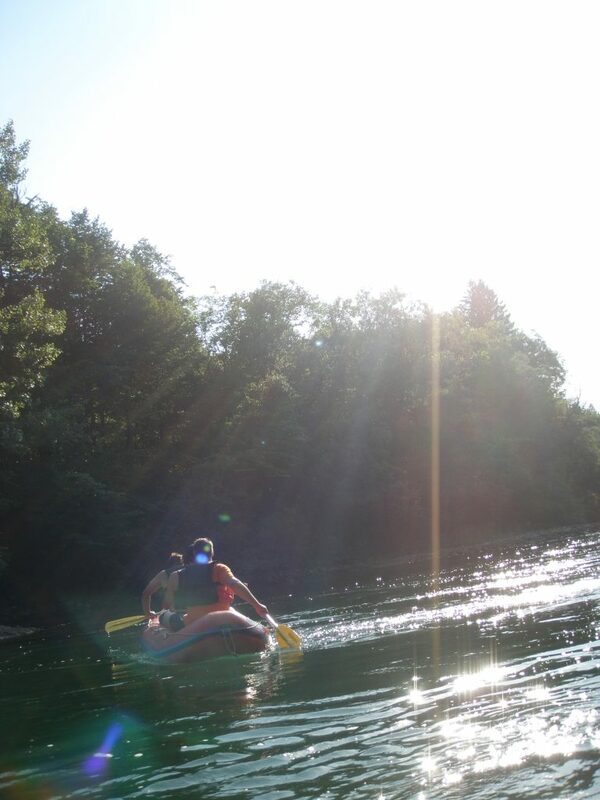 Mini raft is an inflatable canoe for two or three persons. Being extremely stable and easy to steer, it is user-friendly, suitable for beginners as well as for those who have been rowing before. In the Rafting centre Posavec, our guests are welcome to hire these boats or can ask for organised guided descent down the river. 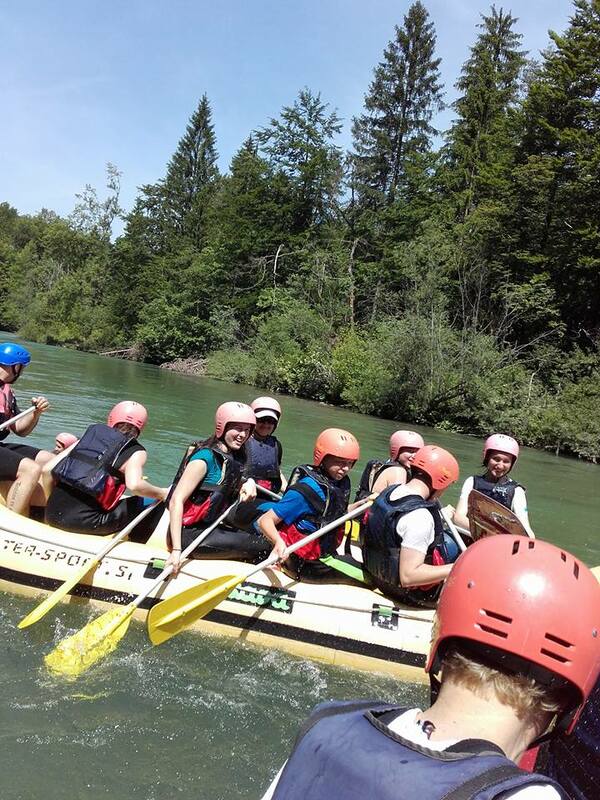 The necessary equipment is the same as for rafting. 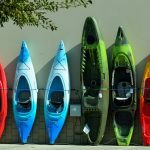 Guided trip: Participants in two or three persons paddle in the canoe, a guide attend them in his own kayak or in one of the canoes. Available on several lakes. 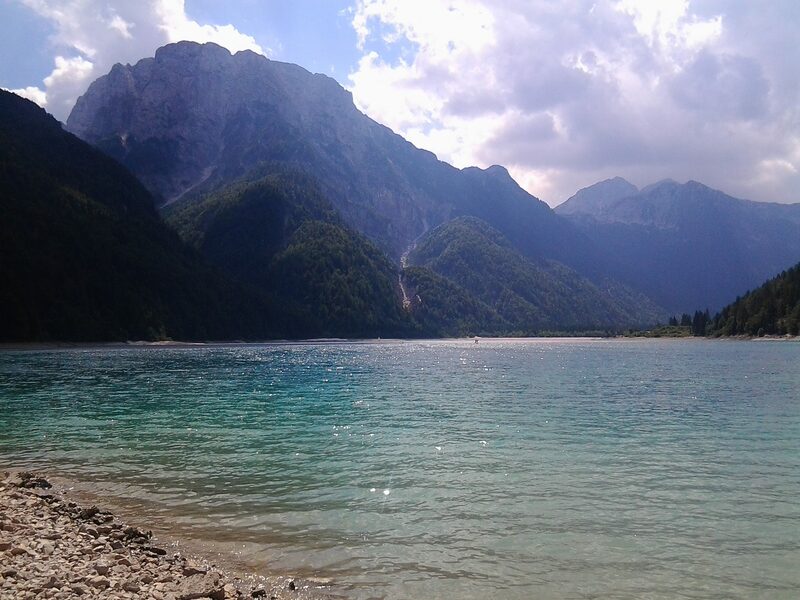 Rabeljsko lake and lake Bohinj offer an excellent natural backdrop. 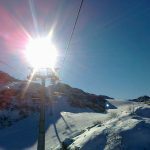 We provide you with a guide with the necessary equipment, who will lead you to the most beautiful and interesting locations. Cool crystal clear water is very refreshing on hot summer days. 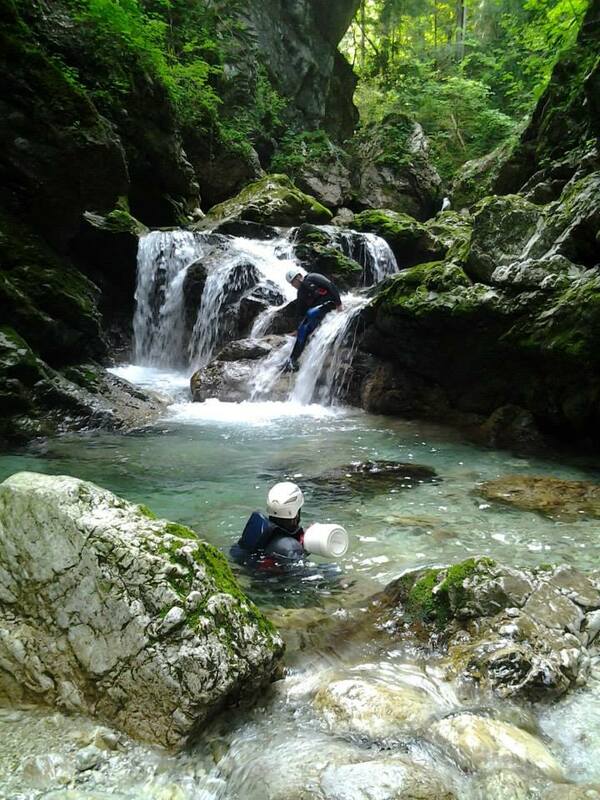 You might have seen the Sava Bohinjka in its canyon high from the road to Bohinj. But now you can let it sprinkle you, and discover its most hidden nooks. The trip begins at the dam HE Soteska (a hydroelectric power plant called “the Canyon”), and continues down the very vivid water towards the famous Češka skala (the Czech Rock). Below the rock we shoot several nice rapids. 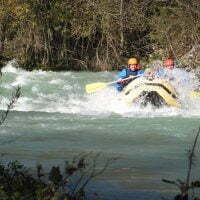 The adrenalin floods our bodies towards the end of the trip, when we approach the most rapid part of the river called “Gibraltar”. 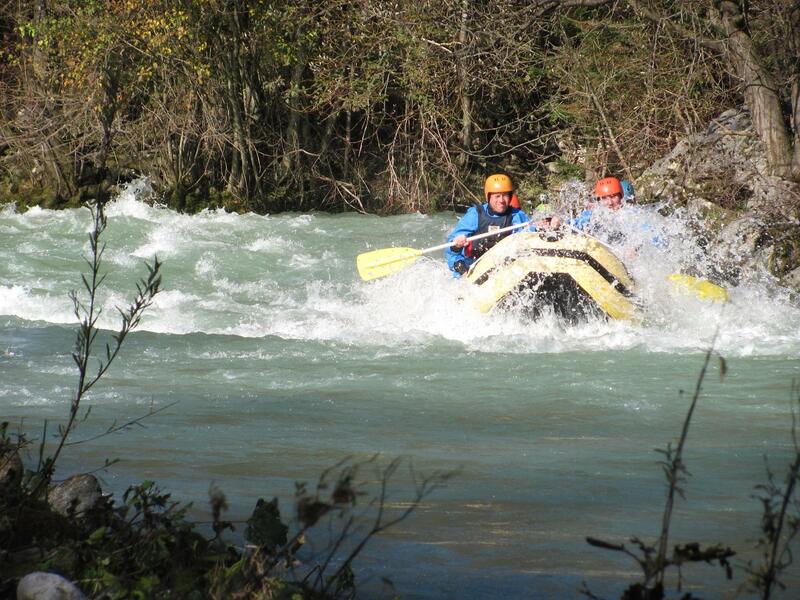 The remaining part of the trip is undemanding, and we soon land bellow the bridge near Bohinjska Bela. Class III. You are invited to explore river-beds from a frog’s perspective. If you have decided to join us, we must first equip ourselves. 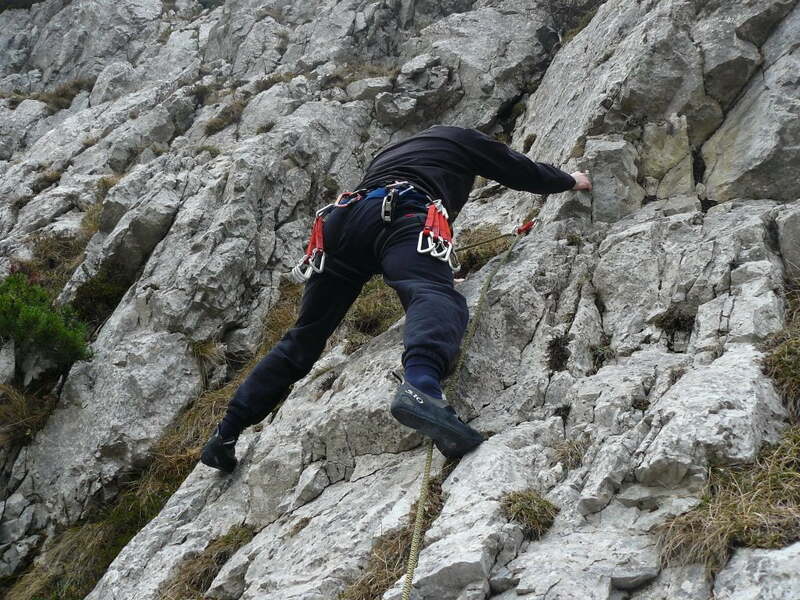 We will put on neoprene garments, socks and gloves, safety helmets, life jackets and climbing belts. 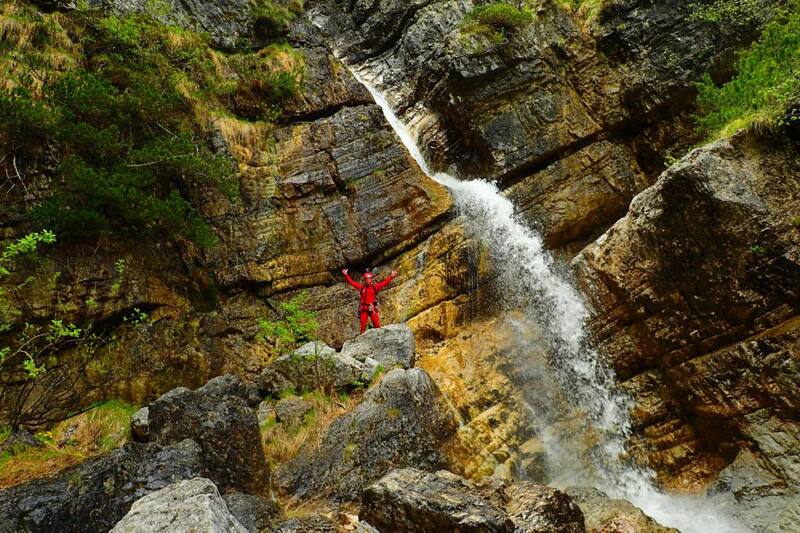 If all this is but a piece of cake for you, we recommend you a visit to the Grmečica Canyon in Bohinj valley. Waterfalls follow each other on different levels – soon the sky above us is screened from our view by overhanging rock walls. Descending the last waterfall, we amaze tourists who have come down a trail to the end of the canyon. 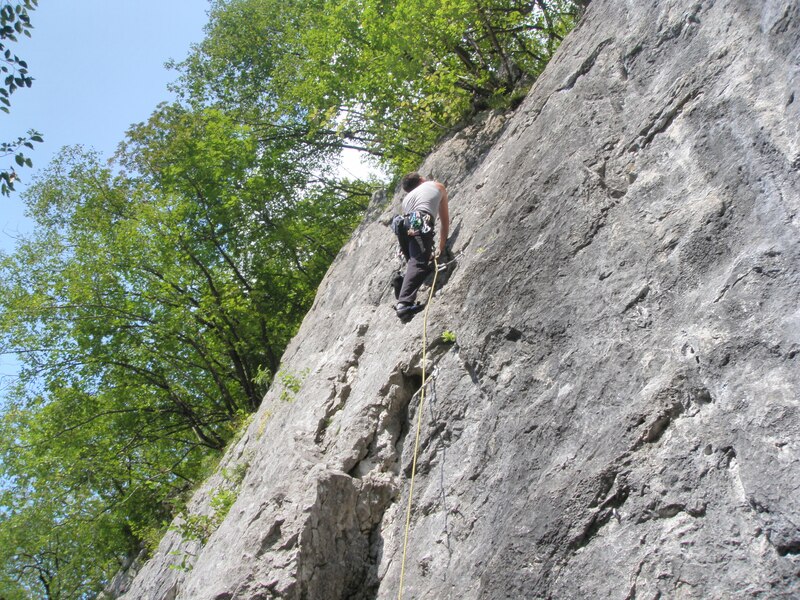 For the adrenaline junkies we orgaize trips to local climbing spots, where you can try your hand at climbing natural rock faces. 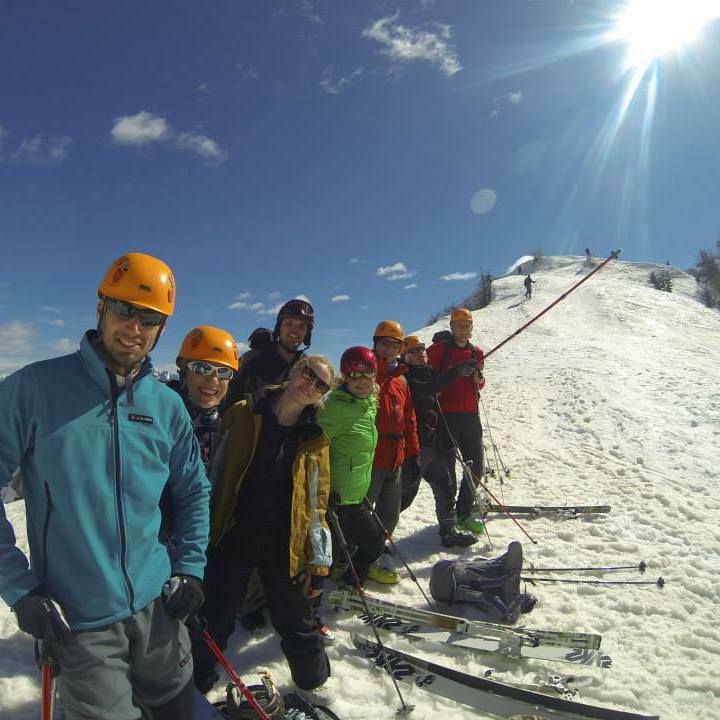 Our instructors will explain the theory and demonstrate the basics. 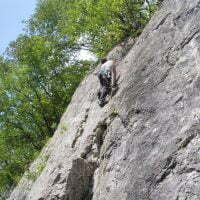 With the top-rope technique you can safely enjoy rock climbing. 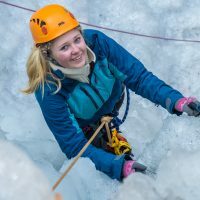 For children younger than 15 we offer recreational rock climbing, where they learn the basics of rope climbing and release excess energy on an artificial climbing wall. Weather allowing, we organize trips to local climbing spots, where children can learn climbing natural rock faces. 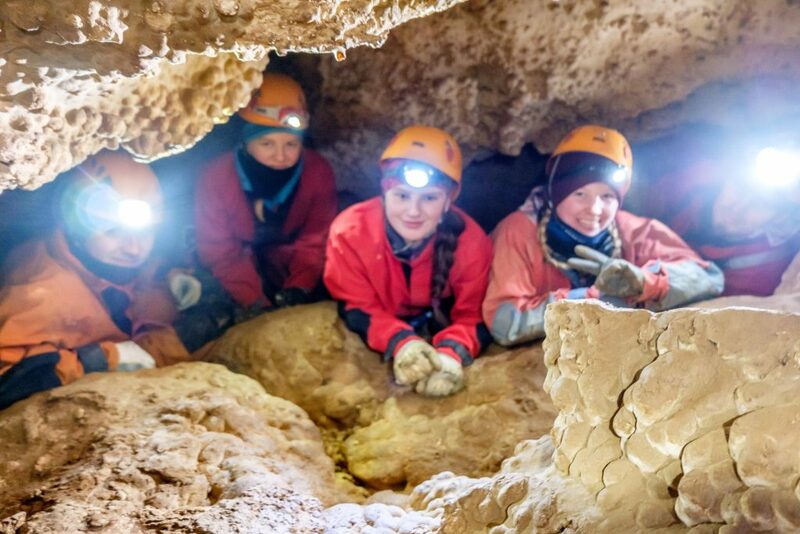 There are many caves and precipices in the area of Gorenjska, among these there are a few that can be visited by tourists, especially if accompanied by an experienced guide. 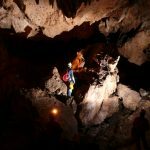 You can go to Turk cave, Jerala precipice, Govic cave, Cave under Babji zob or any other cave in Gorenjska or the Karst with us. 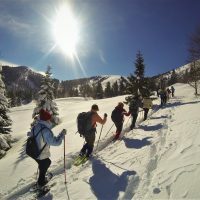 We lend all the necessary equipment and advise our guests to put on some warm clothes and mountain boots. 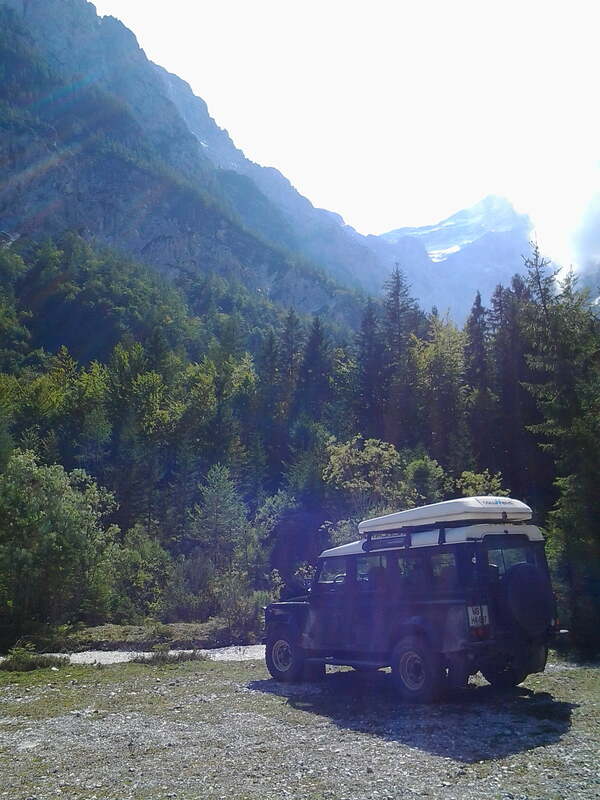 We take four wheel drive vehicles to remote areas of the Karavanke mountains. Mountain roads provide magnificent views and a wild ride. We will visit mountain peaks and mountain villages. Half day trip includes transportation, insurance and a guide. 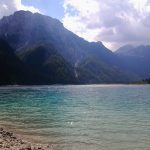 A road trip on mountain roads, a hike to a nearby peak, views of the Julian Alps, beautifull forests, deep gorges, waterfalls, rock faces and more. For a better impression, watch the video below. 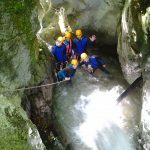 The trip begins at the source of the Lipnica stream, where a cave stream greatly changes the local surroundings after strong downpours. 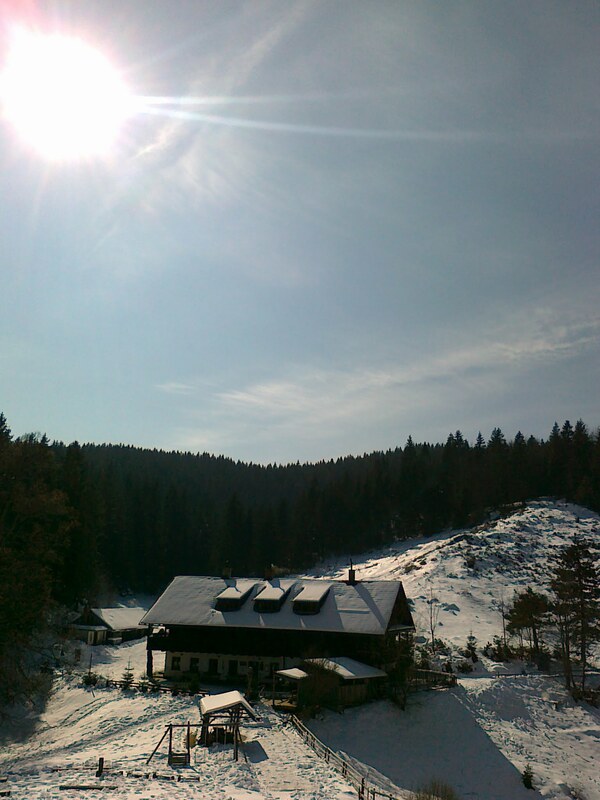 We take a drive on the moutain road to a mountain hut on the Goška ravan mountain. We continue our trip to Lipniška mountain and make a stop at Selška mountain, where you will be offered local home made sour milk and local specialties such as žganci. 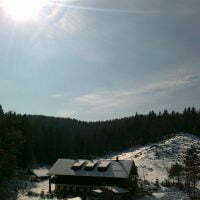 We will pass by a mountain hut at Rovtarica on our way to high marshes on Jelovica. You will be amazed by the power of nature when we take you to the top of the largest wind break on the plateau. From there you can enjoy the view of the entire plateau covered in pine trees. 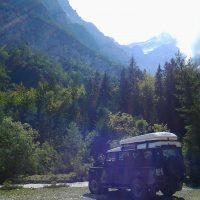 Afterward we take a drive down the other side of the plateau with a remarkable view over the Bohinj valley and the Julian Alps. 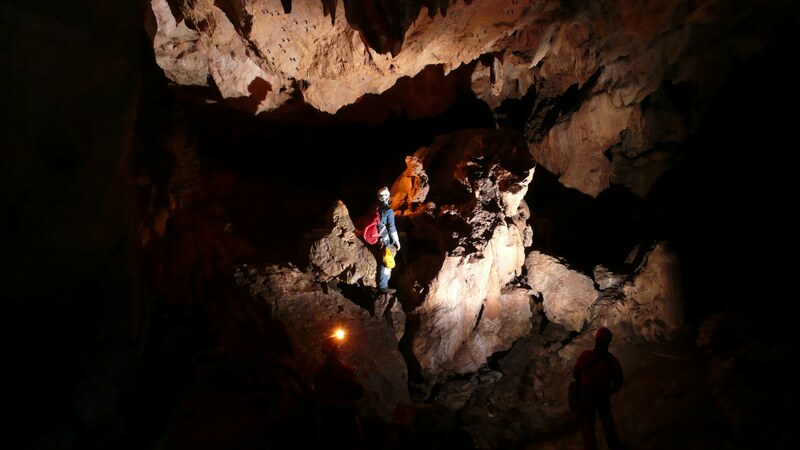 After the drive through a forest we take a walk to the largest cave entrance to a chasm on the Jelovica karst. 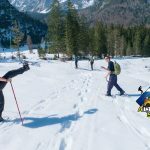 We take a walk around Ribniška mountain and drive on to a mountain hut at Talež, where delicious food and drinks are on offer with a beautiful view of Bled and the Karavanke. 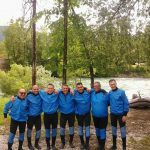 We take a drive through Begunje, the Draga river valley to Planinca mountain. We take an off-road trail through Begunjščica valley to Prevala mountain. A view of the Sava river, Jelovica and Bled opens up. 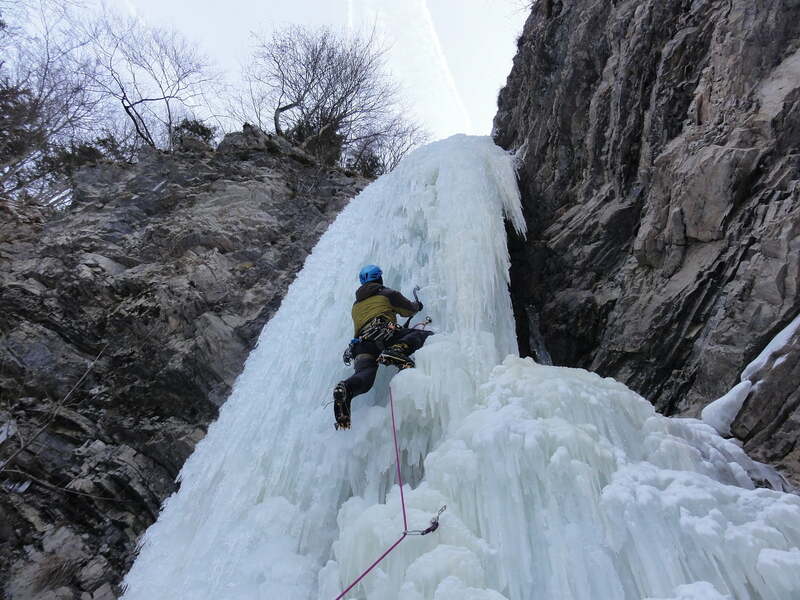 Afterwards we take a mountain road to the village of Podljubelj, where you will enjoy the Tominčev waterfall. Near Ljubelj we climb under the north side of Begunjščica to the green pastures under the peaks. 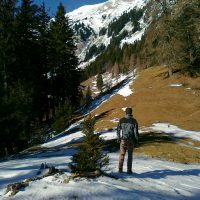 We take a walk to the Triangel, where a beautiful view of the near two thousand meter high peaks and the Austrian valley presents itself. 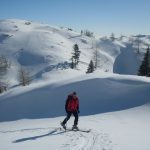 We rest, enjoy good food and drink at the Zelenica mountain hut and continue on past the mountain hut at the source of Završnica up to the pastures under Smokuški avalanche. After a wild ride we stop at the Završnica lake, where we finish the trip by viewing bears. 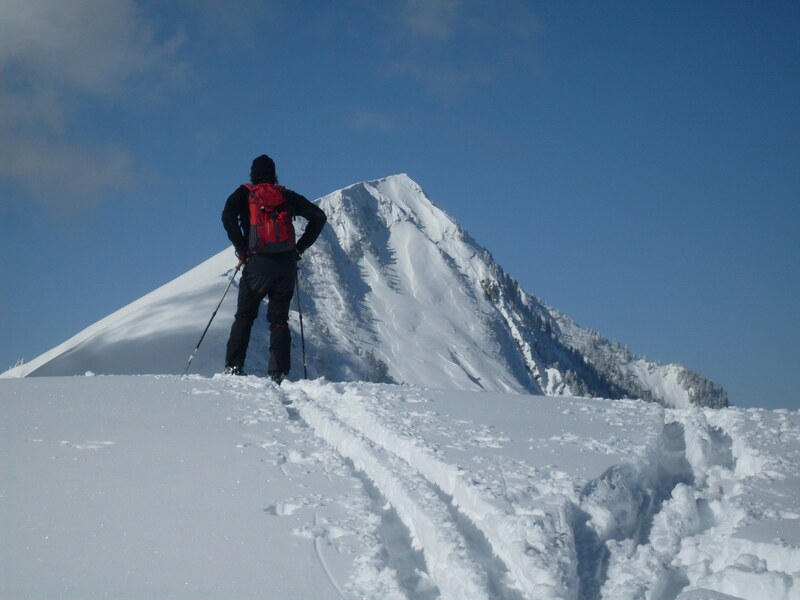 Many mountain peaks are also accessable during the winter season. 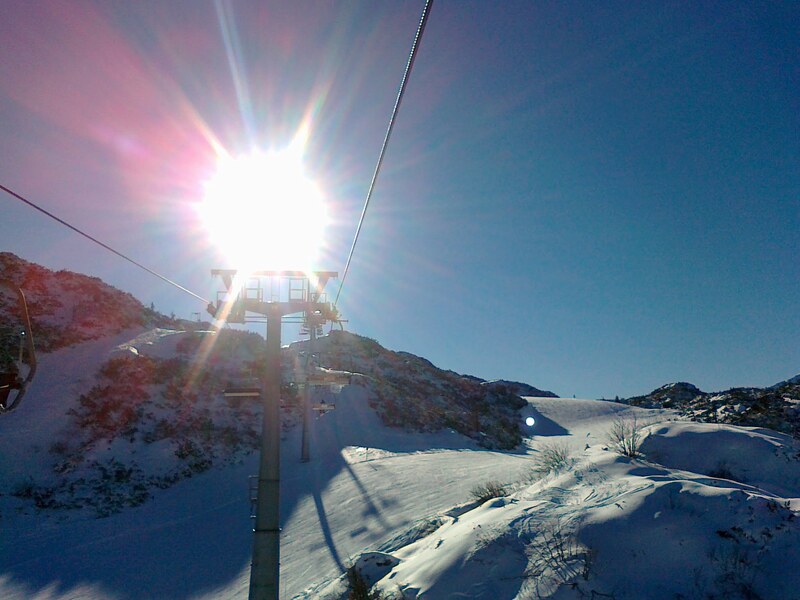 We will entet a wonderfull winter ambient of the Julian Alps mountain peaks and the Karavanke mountains. We adapt the trip to your phisical fitness, in order to make it suitable for all ages. 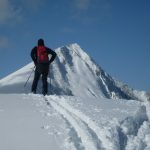 Equipment we supply: Hiking sticks, crampons if needed, pickaxe. Equipment you need: Hiking clothes, hiking shoes, backpack. 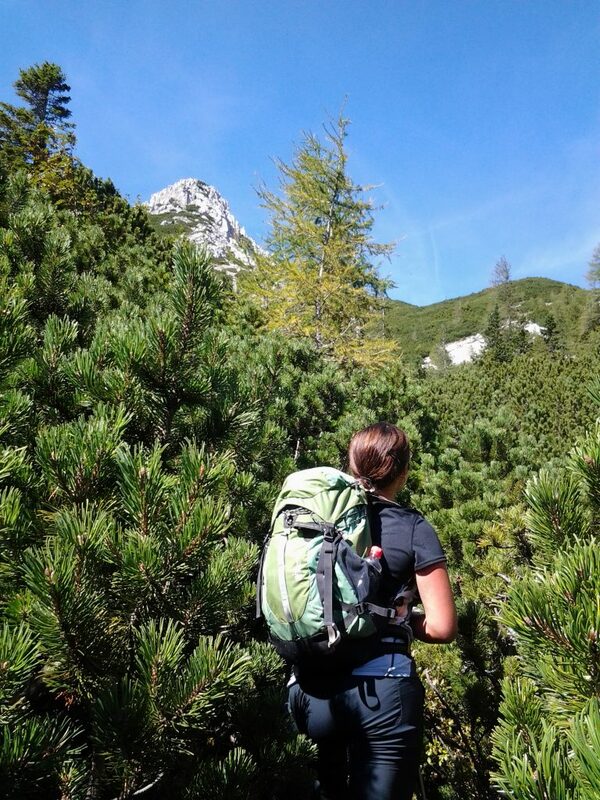 Enjoy a hike in the Julian Alps or the Karavanke mountains escorted by our guide. View the mountains, mountain villages, remote valleys and steep mountain-sides. 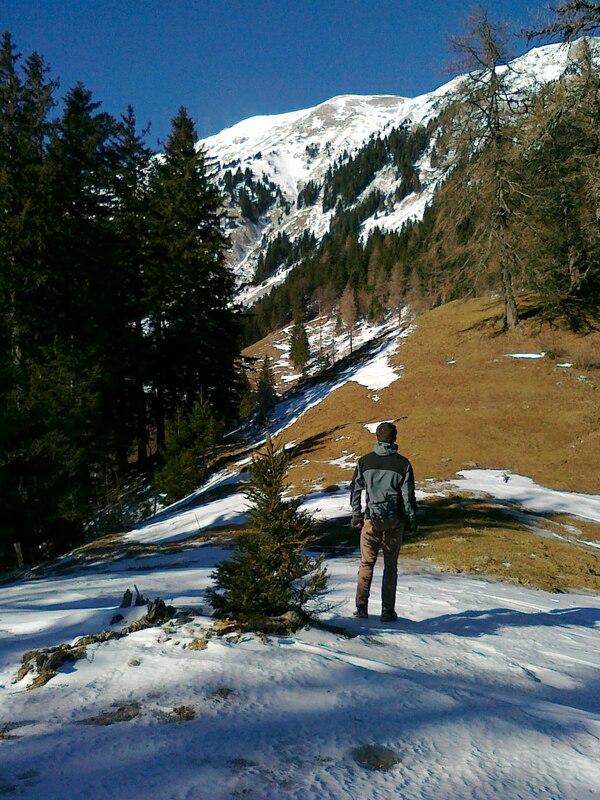 You will need hiking shoes, warm clothes and a backpack with lunch. Transportation, insurance and a guide are included. Guided tours for groups or individuals of Slovenian towns and villages, known and unknown corners of the Alps and the Karavanke mountains. 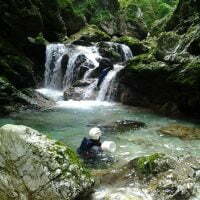 Discover the history and the local sights of remote parts of Slovenia. We organize short trips, longer (1 day) trips and long (several days) trips as requested. We also provide transport from locations in the entire Gorenjska region. Shooting game with paint balls. The competition takes place in a forest, the competitors eliminate each other by shooting each other with paint balls. 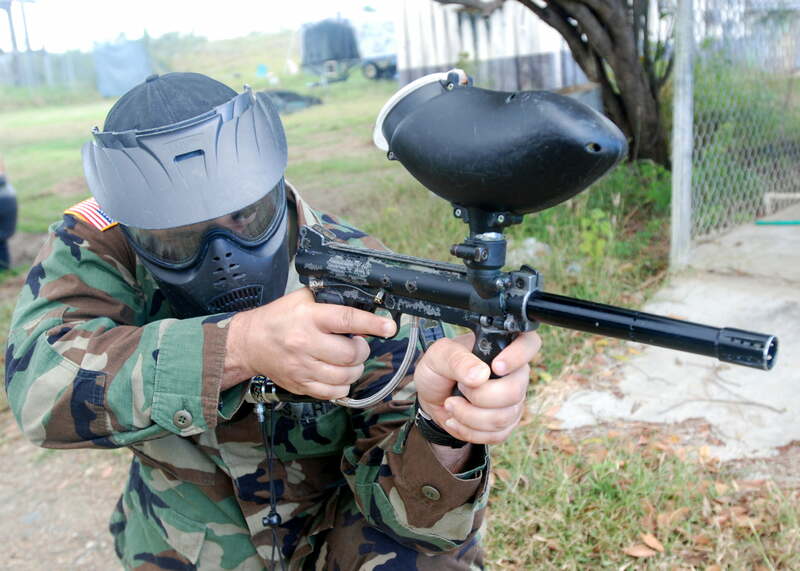 The participants are equipped with protective clothes, masks and paintball guns. 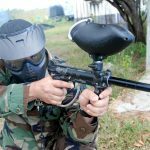 For smaller and larger groups we organize the event on our paint ball course or organize the event at your location. For an offer call 040 663 355 or e-mail altersportklub@gmail.com. The list of rentable equipment and prices. Recreation center Posavec offers a beach volleyball court and a field for mini football. Archery: Organized groups can hire an instructor who gives lessons and organizes an entertaining competition. Minimum number of participants is 6 persons. If you have less, they can join another group. 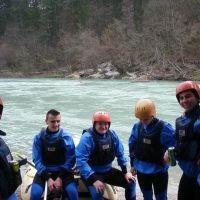 The river Sava Bohinjka only has suitable levels of water during the spring and autumn, as well as very occasional during the summer months and it is not suitable for large groups. Individual discounts can not be added together. When making a reservation, please report an accurate number of participants. In the event of a smaller number of participants we can reduce the reserved price by 10 %. Minimum number of participants is 2 persons. Minimum number of participants is 3 persons. Minimum number of participants is 10 persons. Price includes all necessary equipment and 100 paintballs. 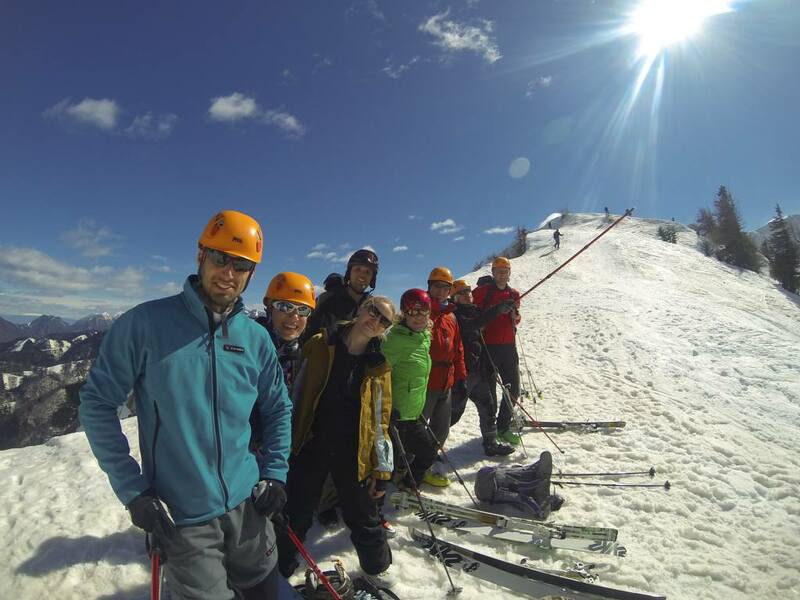 Prices include organization and guides, equipment rentals, transport and insurance. Individual discounts do not add up together. Participents are expected to be in minimal physocal shape and not under the influnece of drugs or alcohol. We reserve the right to change the prices. We apologize for any typing errors. To make a reservation, fill in the form below. 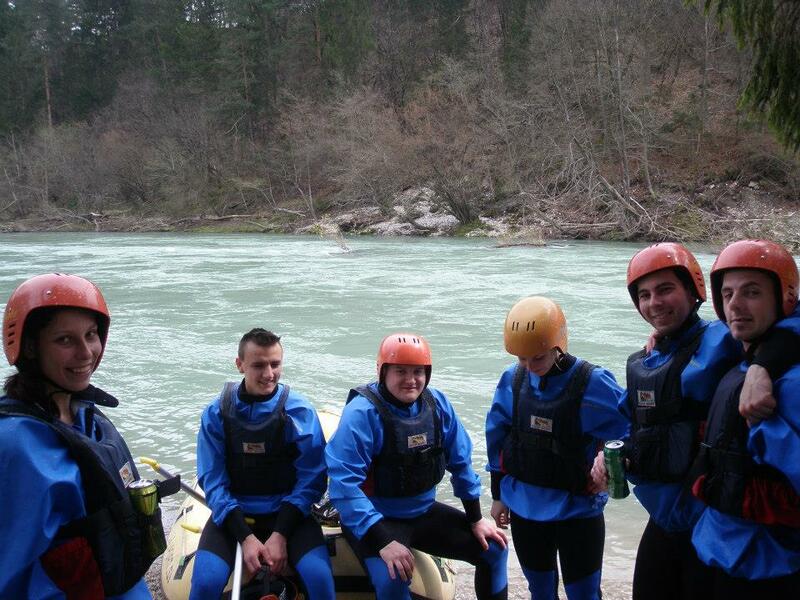 Name Rafting, canyoning, teambuilding and sports days!